ELIGIBILITY REQUIREMENTS: Bachelor’s degree in Latin/Classics, Masters and teaching experience preferred. Candidate must be NYS certified/certifiable, or eligible for NYS certification through reciprocity. 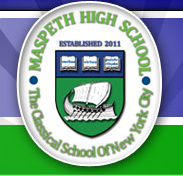 CONTACT INFORMATION: E-mail a cover letter and CV to jobs@maspethhighschool.org.